In order to eat well, you have to cook! This past Friday we broke with tradition….we had a dairy Shabbat dinner. After all the big (and delicious) meat dinners on Rosh Hashanah, we needed a break from the chicken and brisket and decided on a dairy dinner featuring salmon. This salmon recipe caught my eye in the new issue of Cooking Light. With some tweaks, it was quite scrumptious. Preheat oven to 400. Blend all ingredients (except salmon obviously!) in food process until combined. Season salmon with salt and pepper and slather with pesto. Bake in oven for about 10-12 minutes (depending on thickness of salmon) and enjoy! You can tell when the salmon is done when white stuff starts appearing on the surface. I’m sad to report that there were no pictures of this dish…but as you can imagine, it was quite red! To go with this beautifully red salmon, we had squash and beans…roasted butternut squash with caramelized onions, sage, and goat cheese and white beans with fennel and spinach (this recipe was actually in the same issue as the salmon). Toss squash with olive oil and salt and pepper and roast squash in 450 degree oven for about 25 minutes, until brown and tender. Meanwhile, heat olive oil over low-medium heat and caramelize onions until brown and soft, about 25 minutes. Add garlic in last 5 minutes. Remove from pan. Add some butter to pan and let brown. Then add sage and saute until nice and brown and smelling delicious and then add onions and squash into pan. 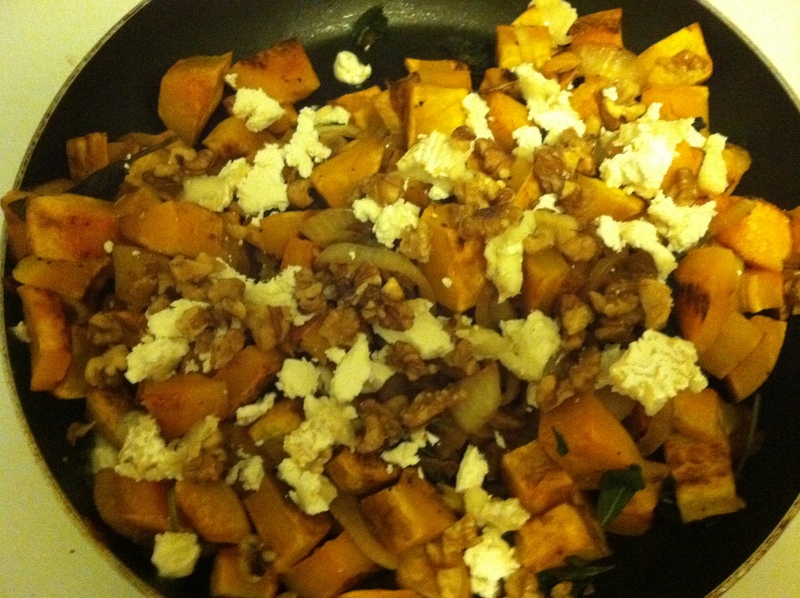 Dot with goat cheese, top with walnuts, and mix to combine until just before cheese melts and enjoy! We used this amazing boucheron cheese…I think it’s a French goat cheese and it is currently our favorite cheese in the world!!! (it’s a bold statement, I know). We used to like chevre noir the best but this definitely takes the cake! 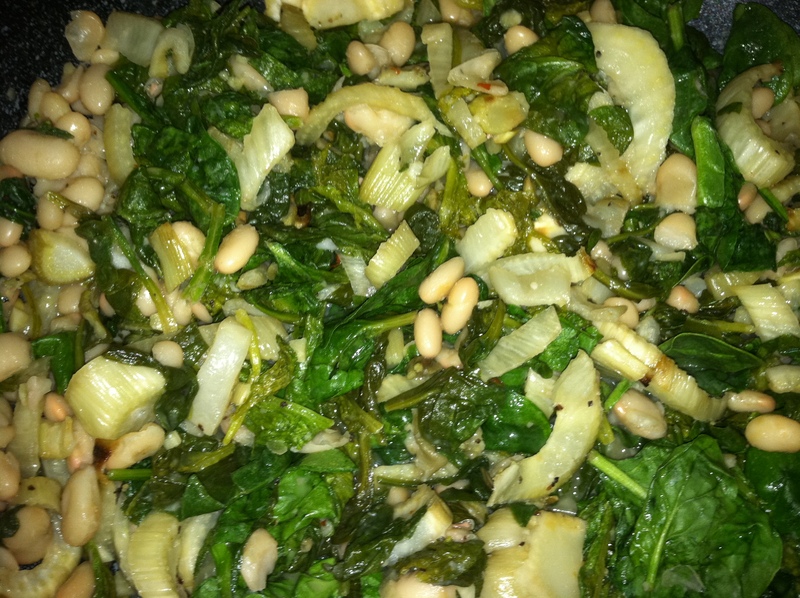 The bean, fennel and spinach recipe can be found here: http://www.myrecipes.com/recipe/warm-white-beans-roasted-fennel-50400000115834/ The only change I made was adding a little rice vinegar at the end. This would actually be delicious as a vegetarian main too. While this meal was delicious, I have to say the star on the show was my challah stand-in…the pretzel bite. That’s right…I made my own pretzel bites. You know, like the kind they make in the mall food court that smell so good? That’s what my apartment smelled like! 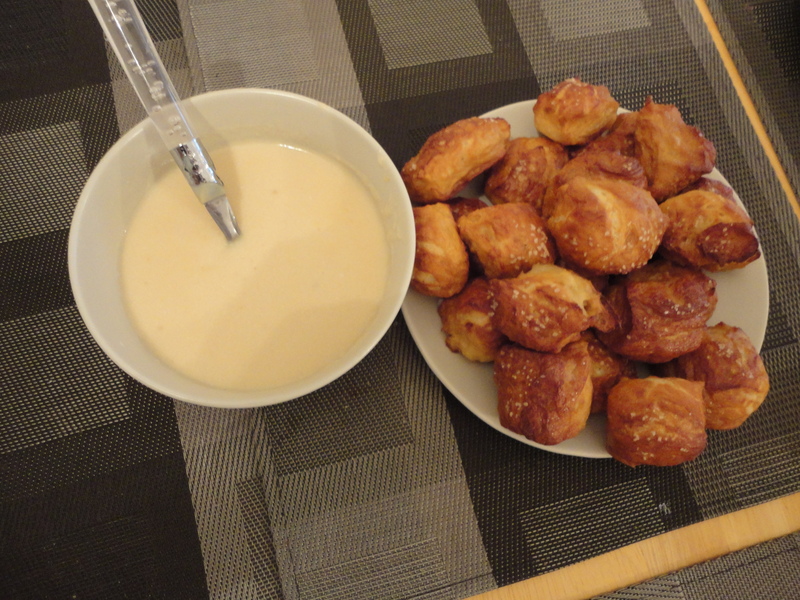 Followed this recipe here: http://www.twopeasandtheirpod.com/homemade-soft-pretzel-bites/ Now the cheese sauce…wasn’t a fan. But the pretzels…they made a fantastic challah! Don’t skimp on the salt and serve with plain old mustard. 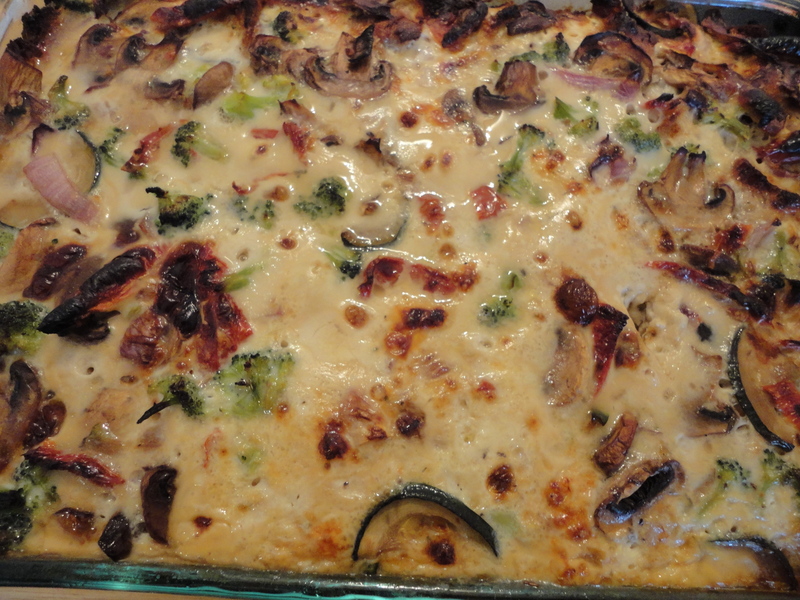 Now, I made this whole recipe (yes a huge 9 x 13 dish) for just Adam and myself. While we do have extra large appetites, we’ve also been eating this every day and I have to say, we haven’t gotten sick of it yet. Now that is a mark of a good recipe! Happy dairy and vegetarian eating! you are so right, I **need** to make those pretzel bites…and by “I” I mean “Matt”!